This content is brought to you by Blue Bird. School buses that are powered by alternative fuels are a prime candidate for funding. And electric is no exception. More and more electric buses are charging into school districts across North America—thanks to funding programs and the buses’ clean operation. This school year, Blue Bird delivered its first electric-powered school buses to customers in California and Ontario. Each customer secured financial grants from various organizations and government programs. The grants covered all or part of the cost of the new electric buses, as well as some necessary infrastructure costs. In Toronto, Ont. Canada, Wheelchair Accessible Transit purchased a Micro Bird G5 Electric school bus through the Electric and Hydrogen Vehicle Incentive Program (EHVIP). The transit company already knew the bus’ excellent quality; it operates 90 percent of its fleet on the Micro Bird G5. The government grant also covered most of the electric infrastructure costs. Three school districts in California started this school year transporting students in Blue Bird All American Electric school buses. The districts capitalized on multiple grants to help pay the cost of the 72-passenger Type D buses and infrastructure. California-based grants include the South Coast Air Quality Management District (AQMD) and Hybrid and Zero-Emission Truck and Bus Voucher Incentive Project (HVIP). Blue Bird is the only major original equipment manufacturer to qualify for HVIP grants in California. While grants are responsible for the purchase of these buses, manufacturers like Blue Bird see a future in this technology that will make these buses more affordable and widespread as a viable alternative-fuel solution. Declining battery costs and improvements in performance, including expanded driving range, have made electric buses a popular alternative to diesel-powered and other fossil-fuel buses. The cost of an electric school bus levels-off over time, due to lower maintenance and fuel bills. With no oil changes, no fuel or air filters, no transmission service and no additional fluids, it’s easy to see why maintenance costs are so low. All that’s needed is coolant to maintain. A recent report states that each electric school bus can lower costs nearly $2,000 a year in fuel and $4,400 a year in maintenance costs, which tens of thousands of dollars over the lifetime of a bus. In addition to funding, it’s the clean zero-emissions operations that appeal to many school districts. Pollution-free electric buses have the cleanest drivetrain available, helping to create healthier communities. For example, one electric school bus is the equivalent of removing five cars off the road or eliminating 23 tons of greenhouse gases. Electric buses also cut noise pollution. The quiet operation of electric buses lowers driver distraction and increases the driver’s ability to hear passengers and other sounds, like emergency sirens or oncoming trains. 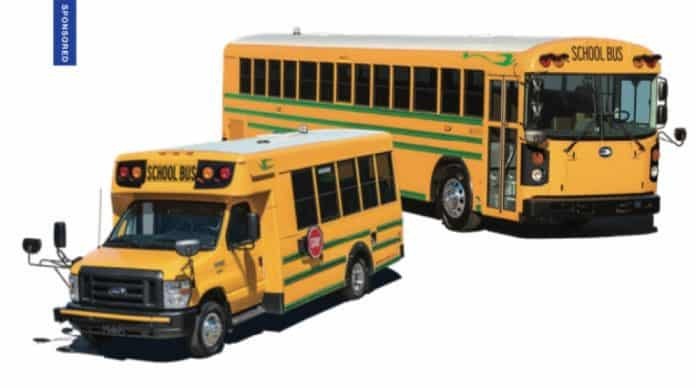 The electrification trend in school buses is spreading fast, and the future is looking bright with high-powered vehicle-to-grid capability coming in 2019, supported by a Department of Energy development grant. Next articleIs Improved Student Behavior Just a Click Away?